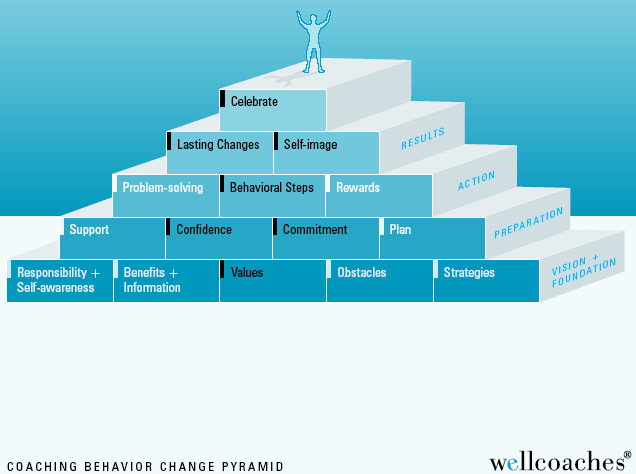 The Wellcoaches’ behavior change pyramid is a powerful visual depicting the importance of building a strong foundation when making health behavior change. If you skip any of the blocks you risk creating goals on shaky ground. The bottom of the pyramid your wellness vision. What would it look like if you were at your best state of health and wellness? Paint a picture of how you would look and feel. What activities would you be engaged in? What do you want more of in your life? Joy, love, hope, confidence? What are your values? If your values include achievement, efficiency and integrity, do you make health decisions based on your values? How about your strengths? Are you compassionate, kind or curious? How can you incorporate your strengths into your health goals? If you are having a hard time pin pointing your personal values and strengths think about what is make you a good employee or a good parent. Make a list of the attributes that make you successful at work or at home. What obstacles have you experienced in the past? Moving past obstacles can involve taking a new path, looking at your challenges through the lens of your strengths, shedding self-limiting beliefs and developing a more flexible mind-set. In order to make change we need to be mindful of our habits. If you begin to feel guilt or shame over your habits or past attempts to reach your goals take a deep breath and sit with your feelings. Are you being fair to yourself? Do you hold yourself to unrealistic standards? We tend to talk to ourselves in a way that we would never talk to a friend. What would you say to a friend in the same situation? Does it match up to what you are telling yourself? What resources and supports do you have to help you move forward? Do you have a friend or a family member you can share your goals with? Have you thought of hiring a coach or a trainer to hold you accountable and guide you through any bumps in the road? Whatever your goals, build a strong foundation consisting of your values, motivators, support, challenges and strategies for success. Your foundation will support your vision and goals at the same time serve as a positive place to come back to if you are struggling. Elizabeth Schenk is a health coach and fitness expert specializing in helping individuals with chronic disease or chronic pain take charge of their health and build a positive vision for the future. Categories: blood pressure, chronic pain, diabetes, diet, disease, disease prevention, exercise, fitness, health, health coaching, stress, well-being, wellness, wellness coaching | Tags: Coaching, disease prevention, goal setting, Health, mindfulness, purpose, self compassion, values, vision, well-being, wellness, wellness coaching | Permalink. Categories: blood pressure, diabetes, disease, disease prevention, exercise, fitness, health, health coaching, heart health, stress, time management, well-being, wellness, wellness coaching | Tags: blood pressure, Coaching, diabetes, diet, disease prevention, fitness, goal setting, Health, heart health, Weight loss, well-being, wellness coaching | Permalink.